WATERTOWN — The Boston archdiocese has placed a Watertown priest, who served in several other area parishes, on administrative leave after an allegation surfaced that he sexually abused a child decades ago. The allegation against the Rev. Frederick Barr “concerns conduct alleged to have taken place approximately 20 years ago,” the archdiocese said in a statement issued Sunday. The Rev. Barr, a Beverly native, was most recently pastor of St. Patrick’s Church in Watertown, where he had been the priest since 2008. Prior to coming to Watertown, Barr was an interim priest at St. John the Evangelist School in Canton. He was the pastor of Mary, Star of the Sea Church in the Squantum section of Quincy when the archdiocese closed it in 2004. The Archdiocese of Boston will not identify the community in which the allegation was made. John Beagan, a Watertown resident who has been going to St.Patrick’s for five years, said news of the allegation was surprising. When Barr came to St. Patrick’s in the spring of 2008, Beagan said he hit the ground running. “He came in kind of like a whirlwind. He’s highly motivated,” Beagan said. Beagan described Barr as someone who is passionate about Catholicism. “He’s deeply passionate about his faith. He’s a natural at understanding the faith,” he said. In the early 1980s, the Rev. Barr was associate pastor of Our Lady of Good Counsel Church on Sea Street, which is now part of Holy Trinity Parish. He left Quincy in 1985 for an assignment at St. Luke’s Church in Belmont. 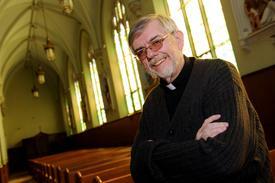 Barr was ordained as a deacon in 1975 after attending St. John’s School of Theology-Seminary. The Boston Area Council of Voice of the Faithful released a statement Tuesday commending the archdiocese for taking action and offering a “listening session” to Watertown parishioners, but said more was needed. “Common sense dictates that the RCAB (Roman Catholic Archdiocese of Bsoton) outreach to both of these parishes,” said Anne Southwood, BACVOTF chair in the statement. When asked about sexual abuse scandals in the church in a 2008 interview wit the TAB, Barr said the church was moving forward.